Milk is a white liquid made by mammals, like cows, dogs, and humans. It is made in the mammary glands (breasts, udders, or teats) of female mammals. Because newborn babies have no teeth, they must be given milk before they can eat solid food. Milk has many nutrients to help babies grow and be healthy. It is also a rich source of calcium which is good for your bones and teeth. If milk is not kept cold in a refrigerator, it will become sour after some time. When milk is warmed, it turns sour. Fermentation makes this happen. Lactic acid bacteria change the milk sugar into lactic acid. Fermentation is used when making dairy products. Milk is often pasteurised before humans drink it. It is made into dairy products like cream, butter, yoghurt, ice cream, or cheese. Pasteurised cows' milk will turn sour if it is not kept in a refrigerator. Milk should be stored between 1° and 4° Celsius. If milk is treated with very high temperatures, it will last longer before spoiling. This means it does not have to be put in the refrigerator until it is opened. Milk contains a chemical called lactose. Babies make an enzyme called lactase inside their bodies. Adults make less lactase. If they do not have enough, they may not be able to digest lactose anymore. This problem is called lactose intolerance and it affects many adults. There are many medicines that help adults digest lactose. Many lactose-intolerant people drink soy milk instead of animal milk, because it does not contain lactose. Soy milk tastes similar to animal milk, but it is chemically very different and is made from soybeans. Goat's milk is the milk from a goat. It can be drunk, both by humans or baby goats, or cheese can be made from it. This cheese is called goat's milk cheese. Coconut milk is not real milk because it comes from a plant instead of an animal. However, it looks similar to real milk because it is white. It also does not have as many nutrients as real milk. It is made by removing the white "meat" from a coconut, pressing or squeezing the "meat", then adding water. It is sometimes used in cooking, for example, in Thai curry. Coconut cream is a thicker version of coconut milk which contains added sugar. Milk forms an important part of a person's daily balanced diet. It contains a lot of calcium that helps bones and teeth to grow stronger. Also, milk provides the body with high quality proteins, and helps in meeting the body's requirement for vitamins. 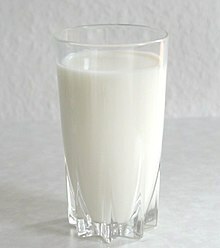 One glass of milk gives about 44% to the recommended daily vitamins intake. Some kind of milks, though, do not have good calcium. These kind of milk products include cream, cottage cheese, ricotta cheese, and cream cheese. ↑ "Sour Milk Recipes". imqh.com. Retrieved 29 April 2010. ↑ "CBM - Fresh goat milk - fresh goat milk from CBM". goat-milk-powder.com. Retrieved 29 April 2010. ↑ "Milk - facts and fallacies - Better Health Channel". betterhealth.vic.gov.au. Retrieved 29 April 2010. This page was last changed on 6 March 2019, at 17:33.